It is normal for animals to eat plants in nature; however, we seldom see plants that could eat animals. As a matter of fact, there are more than 300 plants that could eat animals in the world, and pitcher plant is one of them. 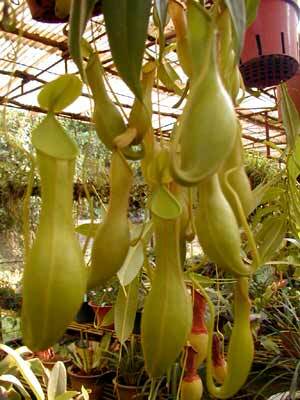 Pitcher plant is a semi-wood vine plant and could grow as tall as 1.5 meters. It originates from tropical areas in Asia, Africa and Australia. Since it generally grows in infertile soils and has very poor root systems, it is very difficult for it to obtain sufficient nutrition. However, in order to suit the nature and to survive, in long-tern natural selection and inheritance changes, the pitcher plant leaves change gradually and evolve into peculiar "insect catchers", or small pockets that could induce and catch insects. The pocket is about 6-12 cm in length with a thickness of 1.6-3 cm; the pockets are varied in shapes, such as round, copper or eggs; the upper part of the leave changes into a lid, round or egg-like, with a length of 1.2-3 cm. The pocket is quite like the net for farmers to place young pigs, and the plant gets its Chinese name, "grass of pit net", from here. The appearance of the pocket has beautiful stripes and spots, and there are honey purses in its inner walls and the edges; therefore, they could easily trick insects to enter the pitfall. In usual times, in order to prevent the leaking in of rain water, the plant often close its cover, but as soon as small quarries fall into it and begin to kick, it would close the cover automatically. Then, it would secrete some chemical weapons to kill the insects and "eat them up". It only takes hours for the small insects to become skeletons in the pocket. The insects are the major source of nitrogen for the plants. Pitcher plant could also be used as medicines and it has effects such as clearing the fever and wiping out inflations etc.